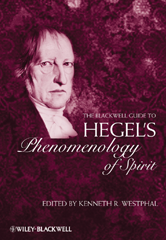 Providing a groundbreaking collective commentary, by an international group of leading philosophical scholars, Blackwell's Guide to Hegel's Phenomenology of Spirit transforms and expands our understanding and appreciation of one of the most challenging works in Western philosophy. - Collective philosophical commentary on the whole of Hegel's Phenomenology in sequence with the original text. - Original essays by leading international philosophers and Hegel experts.